You are a busy leader with responsibility for your facility's security and officer training. The members of your security team have many regulatory requirements for their training, as well as periodic re-certifications. What a time bandit it can be to try and track multiple busy individuals, their training and certification requirements, and their compliance. But with Learning Path®, not anymore. 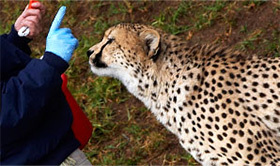 The San Diego Zoo's Security Department employs over 30 officers, who provide round-the-clock security. While turnover in this department is low, it does happen. Angelica Chavez is the Zoo's security supervisor and is San Diego Zoo Global's first adopter of a new tool called Learning Path®. It is specialized software created by our Academy partner, CypherWorx. In no time, Chavez identified the training courses she wanted, the order for new officers to take the courses, weapons certifications, and their future dates for re-certifications. Using the new Learning Path® tool, Chavez created learning paths for each of her officers. Now, with the click of a mouse, Chavez can easily track her officer's training progress, assign new training courses, and track their certification compliance. A learning path is a sequence of courses that allows a learner to master a topic in steps. Typically, a learning path features a Path Title, Description, Image, a Certificate of Completion, and a specific deadline for completion. Within a learning path are steps or approximations that are designed to lead the learner sequentially through the training to mastery. Learning Path® automatically tracks the learner's progress and registers the learner's completion of the path's segments. Upon completion, this important record is then maintained in a database for future reference. The really great news is that Learning Path® goes way beyond any single department's training needs. A learning path can be built for new employee orientation, diver safety, retail operations, department-specific training, managing volunteers, and dozens of other business applications. Learning Path® is a surprisingly simple and intuitive software that allows your Academy administrator to group different training topics together, in a logical progression, and then assign the path to an individual or to the members of an entire department. These learners then follow an established pathway through steps that are linked and progressive (as opposed to assigning several trainings separately). The creator of a learning path has many design options available to customize any learning path for your particular organization. Of course, the administrator has the ability to edit any step after it has been created. The steps can be ordered or rearranged with a few key strokes. Assigning a learning path to a single employee or an employee group is simple, and accomplished through an email notification. The administrator simply moves to the Course Assignments tab found within the ADMIN Section on the left side of the home page, and then follows the prompts. 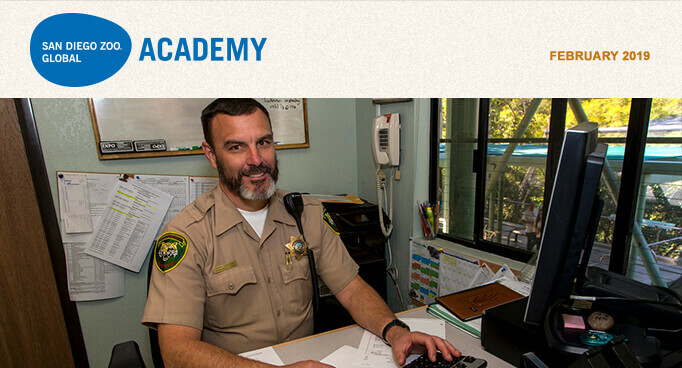 San Diego Zoo Global Academy Puts Beacon College in the Spotlight! Beacon College in Leesburg, Florida, is part of the Academy's collaborative learning environment! Brian Ogle, Assistant Professor & Department Chair, shared the following about their usage of the Academy at Beacon College. "The inclusion of the Academy in the Anthrozoology program has allowed students to explore information as it pertains to real-world application. The application aspect of the modules creates a concrete understanding of the material. The quality and depth of the modules allows the faculty to create new authentic learning experiences during class, rather than spending time lecturing." Please join us for the Administrator's Users Group Webinar, hosted by Academy partner CypherWorx. The next webinar is Thursday, February 21, at 11 a.m. PST. Tending to one's own wellness further empowers conscientious caregivers (and other professionals) dedicated to enhancing animal welfare. The better we become, including our overall state of wellness, the more effectively we can contribute to improving the lives of the animals we serve. Efforts directed to personal wellness harmonize with those of enhancing animal welfare and helping the animals entrusted to our care to thrive. Consistently and holistically addressing human and nonhuman animal wellness fosters a mutually reinforcing culture of wellness and continuous improvement. As I have learned during my journey back toward wellness, when we caringly tend to ourselves—body, mind, and spirit—we are so much better able to help others, including the animals we serve. Our own wellness gives us energy to sustain our good works, and clear and insightful minds to innovate new good practices. It also nourishes our soul, so that we can ethically, meaningfully, and thoughtfully serve others, especially the animals entrusted to our care. Just as with animal welfare, there are countless things we can undertake on behalf of our own wellness. Yes, the time and energy demanded of us in caring for others—loved ones, family, friends, and animals—makes it a challenge to invest time in self-care. But it is essential, if we are to carry on at our best. At times, when my own challenges, shortcomings, and sometimes seemingly overwhelming responsibilities wear me down, I think of others I have known whose spiritual quest for wellness and peace knew no bounds. And because there is so much to love and to serve—family, friends, and animals—the journey toward wellness calls. We proudly serve as caregivers of animals, and we should just as proudly serve as caretakers of ourselves. Doing so is not at all selfish, but rather selfless, as it further empowers us to better serve others, including animals and their interests and well-being. Doing it for us helps them, in more ways than one. The concept of total wellness recognizes that our every thought, word, and behavior affects our greater health and well-being. And we, in turn, are affected not only emotionally but also physically and spiritually. For those of you in Southern California, on the evening of February 13, 2019, James F. Gesualdi will be speaking at the Aquarium of the Pacific in Long Beach on "Shifting from being right to doing right for animals". The lecture is from 7 to 8:30 p.m. Livestreaming is available at www.aquariumofpacific.org/events/category/live_web_stream. Welcome to 2019, and I hope the year has gotten off to a great start for you and your teams. I received some fabulous feedback on my last article about goal setting, and I hope you have set your targets for this year. If you missed the article, go back and read the SDZGA December Newsletter—and it is not too late to set yourself some BHAGs. What is a BHAG, you may ask. It stands for Big Hairy Audacious Goals, and was described in the 1994 book by Jim Collins and Jerry Porras: Built to Last: Successful Habits of Visionary Companies. One of the things dear to my heart is animal welfare, and especially fish welfare. Sadly, we still hear people state, "But it is only a fish, they don't feel pain." There has been a dramatic increase in the past decade in the number of articles written about fish welfare. See the chart below that I came across recently. It is from the Web of Science, using the two words "fish" and "welfare." The growth is almost exponential, which for me is very exciting. There is also an excellent book that I have mentioned previously that is worth a read: Do Fish Feel Pain? by Victoria Braithwaite. For me, this book is the definitive work explaining that yes, they do. The next two major groups of animals kept in aquariums that are increasingly being examined from a welfare viewpoint are cephalopods and crustaceans. Cephalopods in the USA are not under Institutional Animal Care and Use Committees that deal with research and teaching. In both Australia and the EU, cephalopods are covered under legislation. Increasingly, these highly intelligent animals are being recognized as extraordinary animals that deserve to be treated humanely. Cephalopods have a short lifespan; they grow and breed and die. Lifespans are as short as six months for smaller species, and up to a maximum of five years for the giant Pacific octopus Enteroctopus dofleini. The jury is still out for me as to whether cephalopods and crustaceans feel pain. However, we still need to treat them like the Old Testament says "A righteous man (woman) cares for the needs of his (her) animal" (Proverbs 12:10). I would also like to ask for some feedback and suggested topics for me to discuss in 2019, and again make this your best year ever. What is the ideal length for a story? Is it okay to make up stuff? How can I use social media to tell stories? These are just some of the questions we regularly hear when we conduct storytelling workshops for our clients. And after leading over 500 workshops for organizations large and small around the world, I usually have a pretty good idea of what's coming every time we pause for Q&A. So this month, we'd like to share our answers to the 10 most frequently asked questions, because we're guessing that you may have been wondering about some of these things, too. Q. What is the ideal length for a story? Q. If everyone is telling stories, won't my audience get tired of stories? A. After a 10,000-year run, it's doubtful that stories have suddenly lost their power. The reason stories fail is not that people are tired of stories in general. It's more that the storyteller has failed to produce something fresh, authentic, and compelling. Romantic comedies are a case in point: we've all seen a bunch of them, and everyone knows what to expect, but when someone finds a fresh way to tell the story, we'll stand in line to see it. (Still not convinced? Go see "The Big Sick.") When people suddenly stop going to movies, watching TV, and reading books, then you can start worrying. Q. I feel uncomfortable telling somebody else's story—I feel like I'm exploiting them. Do you have any advice about this? A. We hear this a lot, and we're very sensitive to the issue of exploitation or appropriation of someone else's story. The best-case scenario is when the individual can tell her or his own story. Nothing is more powerful than first-person storytelling, i.e., having someone stand before an audience and say, "This happened to me." If your storyteller is not comfortable, or simply cannot be in a certain place at a certain time, then the next option is to obtain their permission (preferably in writing) to tell their story, using their name and all the facts as they happened. Sometimes people will want you to tell their story, but will ask you to change their name and a few details to protect their identities—that's a third option. And lastly, in some cases, you may have a community that's so small that changing the name and a few details would not be enough to hide their identity. In those cases, you can create composite characters, saying something like, "This is the story of Mary. Everything that happens to Mary happens to women in our program, and all the outcomes are real outcomes. But Mary actually represents many women, so while her story isn't factual, it is truthful nonetheless." A. If you can tell a story exactly as it happened, being faithful to every single fact, that's the best-case scenario. Sometimes, however, you may be fuzzy on some of the facts or may not be able to recall certain details, such as specific quotes from a conversation. In that case, if you offer your best recollection, that's acceptable, as long as (a) you disclose to your audience that some parts of the story are "best recollections," and (b) you are not in any way altering the basic truth of the story. For example, if you say that you met someone on a Tuesday and it turned out to be a Thursday, it's unlikely that would have a material effect on the truth of the story. But if you say you personally saw thousands of homeless individuals when, in fact, there were only hundreds, then you are stretching the truth in what is probably a misleading way. A. Your website is probably your primary audience-facing medium, so that's the first place to consider. And if you want to tell stories on your website, video is your best friend. Your audience is much more likely to sit and watch a 2-3-minute video than they are to read 750 to 1,000 words. If video is too expensive or takes too long to produce, you can also tell stories on your website using pictures with captions or short summaries. (Exposure.co or Atavist are great resources to help you craft image-driven stories.) Newsletters—either electronic or hard copy—are also great vehicles for storytelling, and if you're delivering speeches or making presentations, you should weave stories in there, as well. As for social media, you can certainly tell stories on YouTube and Facebook, but I see the principle value in Twitter, Instagram, and similar tools as pointers more than carriers of content. Tweets can serve as compelling headlines with a link that you follow to a place where you can spend a little more time watching or reading a story. Q. Is there a correct amount of data to sprinkle into your story? A. I have yet to see research that specifies a certain number of data points per words in your story, but I'm a believer in "less is more." If your two- to three-minute story can make one data point memorable and compelling, that's enough. Q. What if I don't have enough time or space to tell a complete story? A. First, if time or space is limited, consider "connecting narrative moments." This term, coined by Frank Dickerson, is a fancy way of saying that sometimes a snippet from a story will do—a single moment or a scene that evokes emotion without having to tell the entire story. (Ernest Hemingway is famously credited with evoking an entire story with only six words: "For sale. Baby shoes. Never worn.") But you should also consider creating a little extra space or time for a story, even where you think there isn't any permitted. I know of several instances where people had to submit proposals or make presentations that had very strict guidelines, and there was no room for a story. They filled in all the boxes as required, gave all the information necessary, but then added a short story to bring a human dimension to all that information. I believe it's worth the risk. Q. What if you're talking to an audience that actually prefers data to stories? A. You may run into audiences—scientists, economists, researchers—who are inclined to see data as serious business and stories as "fluff." I'm not insisting that you force-feed them stories; sometimes, if data is what they want, just give them the data! But if those same people are ever in the business of changing how people think and behave, then you have to explain to them that numbers do not have that power by themselves. (If you want to cite a higher authority than me, refer them to the Nobel Prize winning economist Daniel Kahneman, who said, "No one ever made a decision because of a number. You have to give them a story.") Stories are like the software of the mind, telling us what data to let in, and what data to ignore. If you change the story, you can open their minds to your data, so you need to tell stories first. Q. You say that audiences can only identify with one person—but what if the story is really about a team that worked together towards the goal. How do I tell that kind of story? A. Identification is a one-on-one process, that's true. People do not naturally identify with teams, groups, or an entire organization. That said, if your story is about a team, then introduce the members of the team one by one, and let your audience meet them as individuals. The audience can then track the progress of the story as the responsibility for moving the action forward passes from one team member to another. Q. I work in policy (or systems) change. I don't do direct service delivery. How can I tell a compelling story? A. You have two options. The best-case scenario is to tell a story that shows at ground level (and featuring real people) how your policy or systems change is improving lives. If your audience can see that change up close and get a true feeling for the impact it's having, then they will follow the links in the chain that ultimately lead from ground level all the way to your offices. If you simply don't have access to those stories, you have another option. Effecting policy or systems change often boils down to getting people together in a room and moving them from no to yes. Changing minds isn't easy—it's a challenge we all face in one way or another—so stories about how that is accomplished hold interest for everyone and are also worth telling. The Goodman Center's next online storytelling class will be April 8, 15, 22, and 29 from 9 to 10 a.m. PDT / 12 to 1 p.m. EDT each day. For more information about The Goodman Center, visit thegoodmancenter.com.